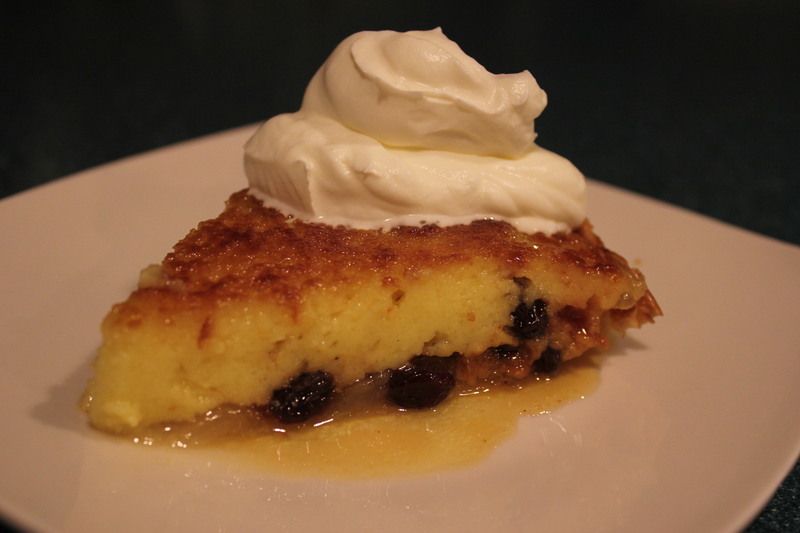 Let me set the scene for you… as we soak plump raisins in rum allowing them to rehydrate, while further adding pure, sweet custard for a rich, enticing experience infused with just the right hint of warmth. Perfect for chilly evenings by a crackling fire place with perhaps some friends and family after a nice meal. I absolutely love rum raisin ice cream; I became addicted to it in my early twenties. I don’t eat it very often any longer but when I do, it is relished! 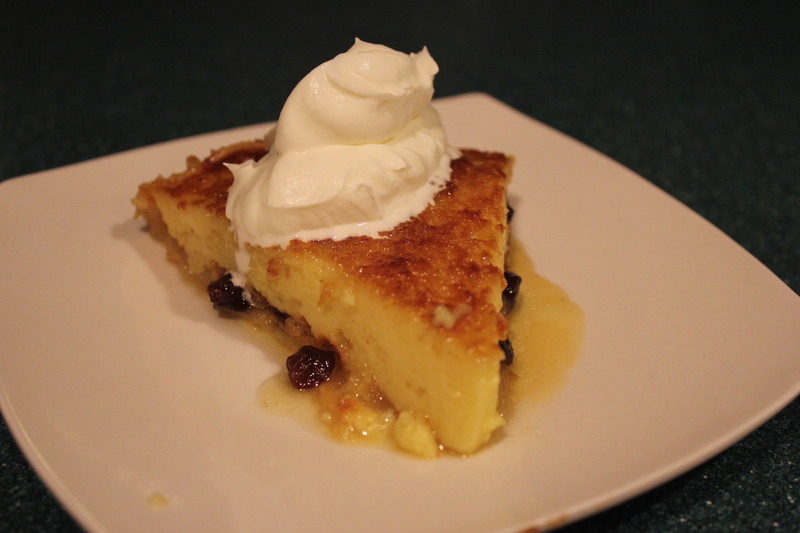 Raisins, and rum for that matter have long been a staple of desserts, creams, and puddings; but when applied to a vanilla custard base, the flavors truly excel: a concerted burst of fruit cut by the jolt of rum, all cushioned by cream and eggs. It has a kid-friendly appeal and grown-up intricacy, all in one dessert. My daughter and I made this; MacKenzie did most of the work. She was very pleased with the way it turned out and could not wait to take a bite (I know this from her asking several times if it was ready). I guess when you want some sweets it is hard to wait for it to cool down. (We should have waited a bit longer but she was so ready to dig in) I made a homemade rum flavored whip cream to go with it as well. Whipped topping is just heavy cream, confectioners’ sugar and rum flavoring. Beat until it forms soft peaks DONE! Some people detest alcohol in their food, so you can make this with rum flavoring and skip the alcohol all together. This was a nice and creamy dessert. 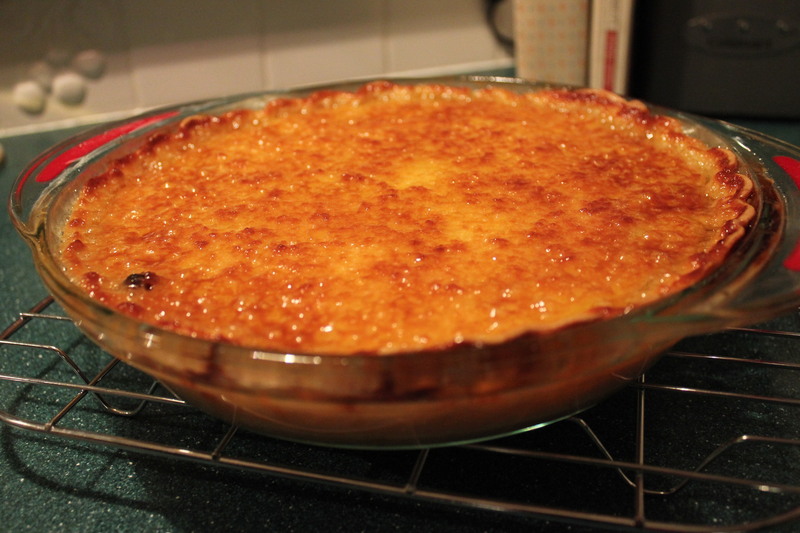 If you’re partial to custards you will love this pie. I thought it was very satisfying for the sweet tooth, I prefer the more savory desserts personally, but this was delicious. I am sure it won’t last long, and will be gone from the house before long. Take your raisins and soak in the rum. Turn out your dough onto a lightly floured surface. Roll out to a 12” round, we want this to fit into a 9”glass pie plate. 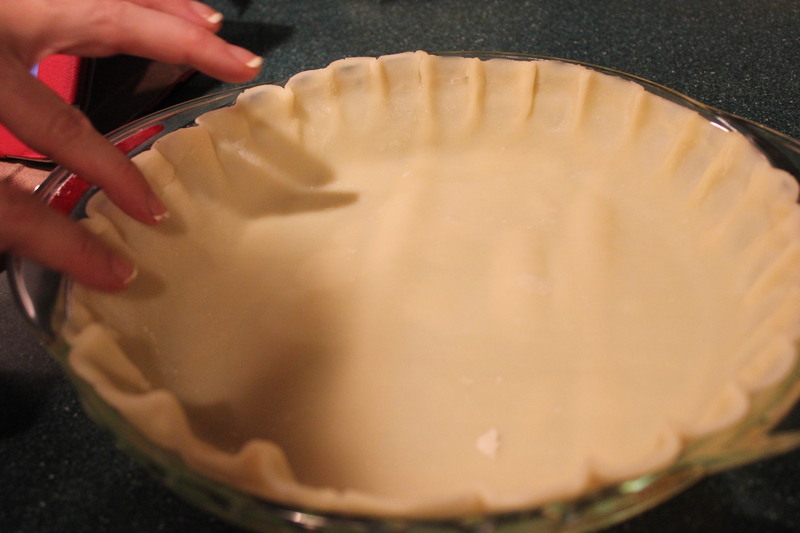 Trim the dough flush with the edges and crimp, by pressing your fingers together and creating bumps around the pie. If using homemade dough refrigerate to make it firm, about 30 minutes. If using frozen premade there is no need. 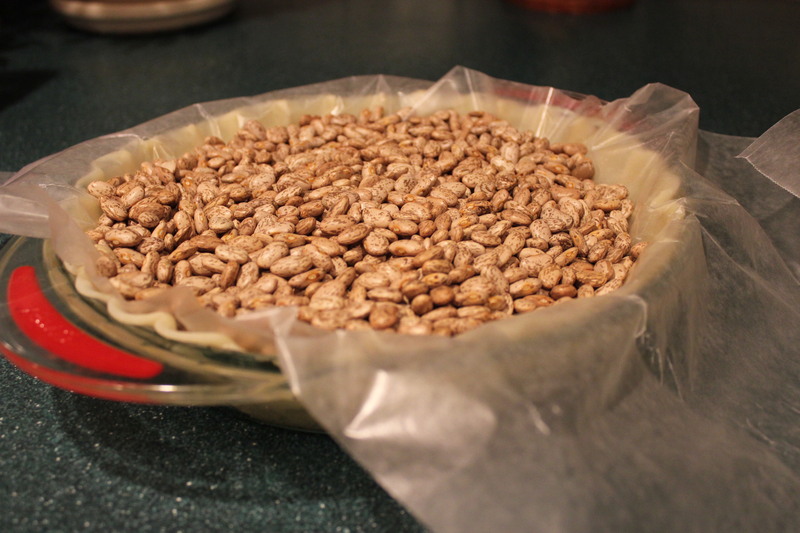 Preheat the oven to 400 degrees, line the shell with parchment paper and fill with pie weights. If you (Like most of us) don’t have pie weights or better yet your scratching your head thinking what the heck is a pie weight?? Don’t worry I have you covered, you can use beans as a weight. Just buy a bag of inexpensive beans and fill the pie plate with them. This will keep the dough from bubbling and allow it to cook while keeping its form. Cook at 400 for about 15 minutes, reduce the oven temp to 375 and remove the parchment and weights, puncture the bottom of the crust with a fork a few times, now throw that bad boy back into the oven to continue baking for another 20 minutes. Remove and allow it to cool on a rack. Bring your 3 cups of cream to almost a boil over medium high heat in a saucepan. Remove from heat and set aside. 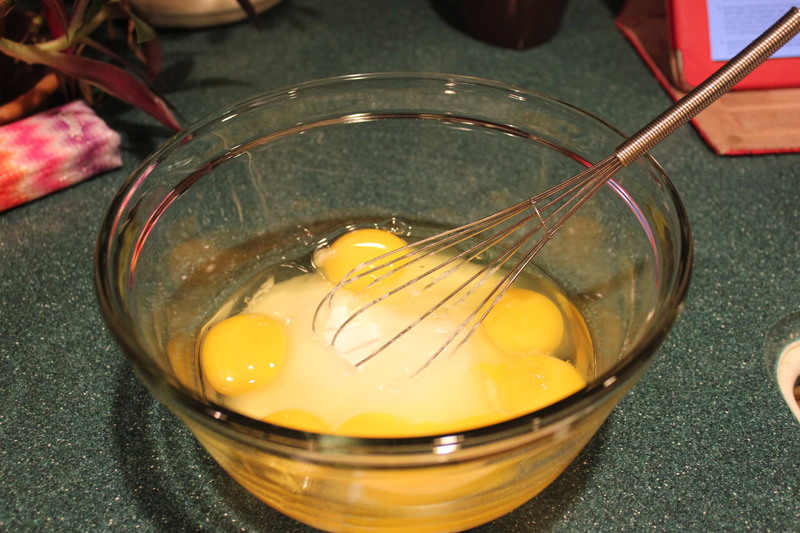 At this time you can whisk together the sugar and eggs (whole and yolk) as well as the salt. 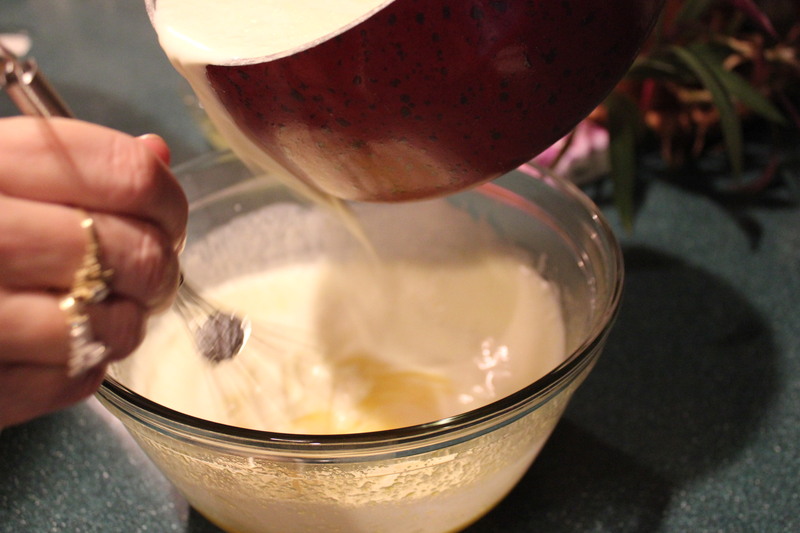 Now for a tricky part… Slowly pour in the hot cream while whisking the eggs until they are combined. POUR SLOW!!! The last thing you want to do right now is COOK your eggs, we want a creamy consistency to the product, not a cottage cheese consistency! Take your time doing this! Now we will take this mixture and put it back into the saucepan, over medium LOW heat cook it stirring constantly. Make sure it is a low heat, if you think you can cook it quicker and turn it up, be my guest.. You will end up with scrambled eggs! Trust me on this one! Cook low and slow stirring at all times. Once it starts to thicken and you can leave a mark with the spoon across the top you are done. This should take about 12 to 15 minutes. Using a sieve strain the rum from the raisins, set the raisins aside. Add the rum extract or rum at this time. 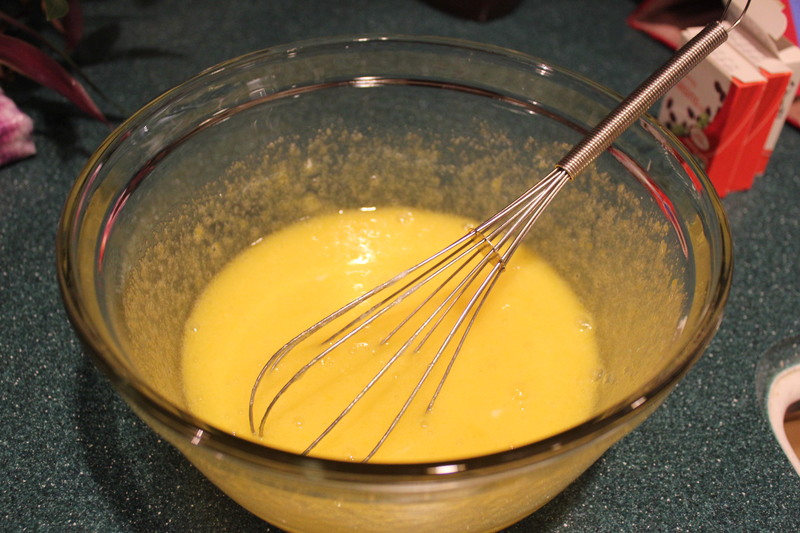 Remove the custard from the heat source and set aside. Arrange the raisins on the bottom of the pie plate. 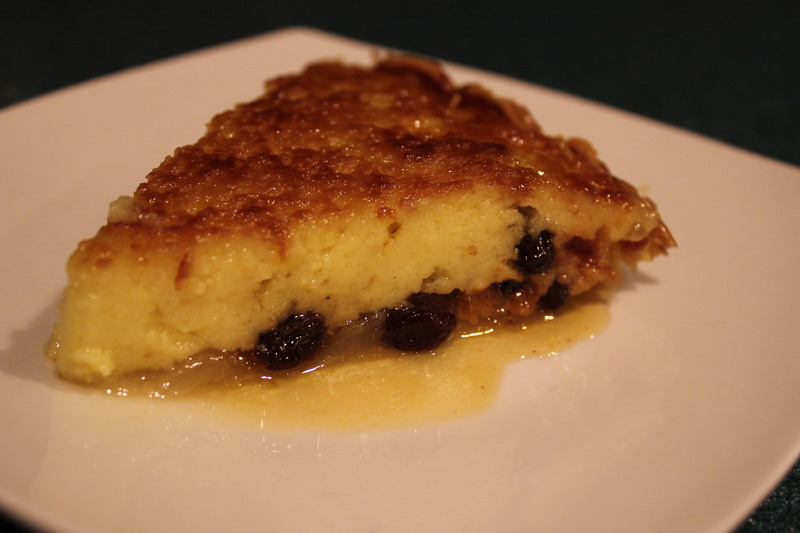 Pour the custard over the raisins; be mindful that the raisins may move about if you pour all whilly nilly. Pour and try to keep the raisins at the bottom of the mixture. Bake at 375 for 25 to 30 minutes. If the top is not dark enough, broil on hi for a short time creating a nice brûlée on the top. This is not needed but makes a nice presentation. 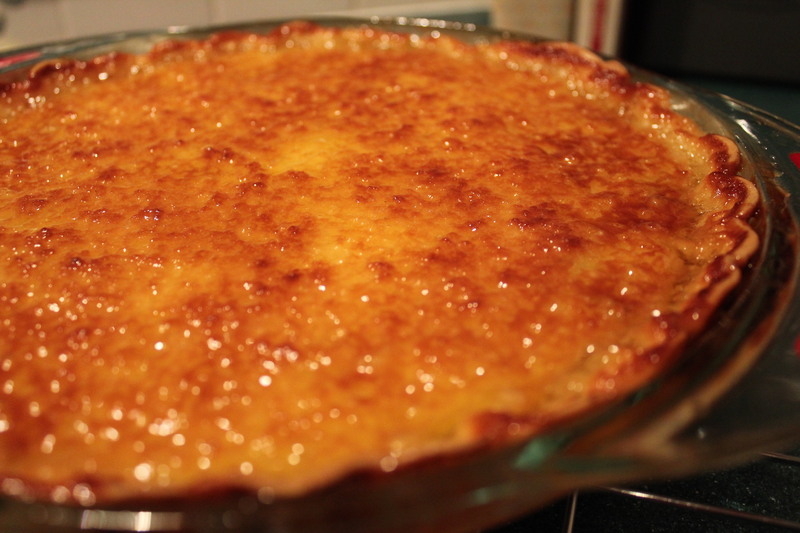 Brulee meaning literally Burnt Cream..
Once cooked cool completely on a wire rack. Don’t be in a rush to cut into it, allow it to come to room temperature before digging in. It will make all the difference, waiting a little bit is well worth it in this matter. Before serving wow everyone with your homemade whipped topping. They don’t need to know how easy it is! Mix the rum extract, heavy cream and confectionars sugar until it forms stiff peaks. 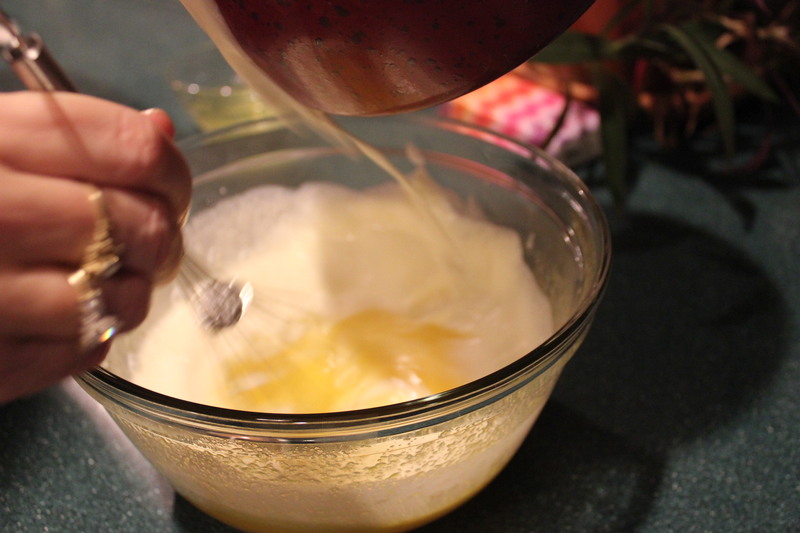 Don’t over beat it, this will create butter fat, and start to separate the milk from the cream. You will see this if you start to see it turn grainy. If so add a bit more heavy cream beat again until it is creamy. Looks delicious and the photos make it look even better. I absolutely love custard pie and this pie looks so delicious. I will be taking your recipe and try it for the holidays. Thanks so much. It looks so yummy. yes thank you and I will take your advice, but I am not good with making crusts. So I will buy a frozen one from the store so that should save me a lot of work. My husband and I could eat a whole custard pie between the two of us. LOL! thanks I need the heads up on this…..every little bit helps. sorry have a question about how much sugar is needed when mix with egg? Lovely!! Baked rum raisin pie for the first time!! And love the taste yummmmmmmmmmy !! !